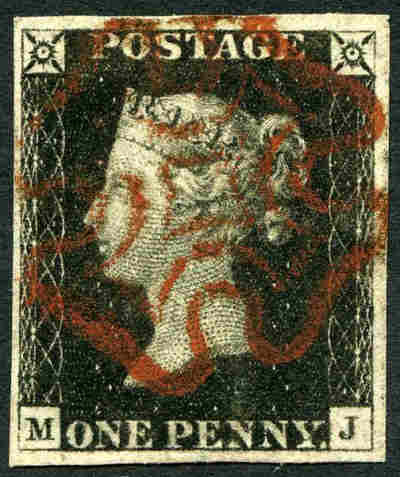 1840 1d Black Queen Victoria imperf from Plate No 1B fine used with 4 very fine margins and Red Maltese Cross cancellation. Corner letters M.J. Sg 2. Catalogue Value $578.00. 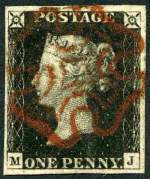 1840 1d Black Queen Victoria imperf from Plate No 7 fine used with 4 good margins and Red Maltese Cross cancellation. Corner letters H.B. Sg 2. Catalogue Value $630.00. 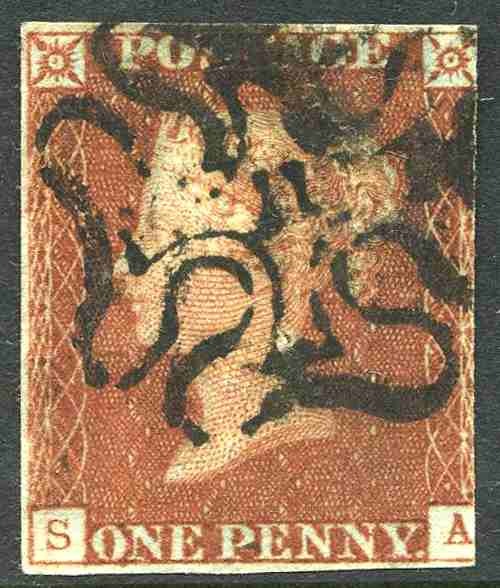 1841 1d Red-Brown Queen Victoria imperf with 3 margins, cancelled with complete clear No 1 in Maltese Cross postmark. Slightly cut into at upper left. Corner letters J.D. Sg 8m. Catalogue Value $290.00. 1841 1d Red-Brown Queen Victoria imperf with 3 margins on piece, cancelled with complete clear No 3 in Maltese Cross postmark. Cut into at lower right. Corner letters B.D. Sg 8m. Catalogue Value $345.00. 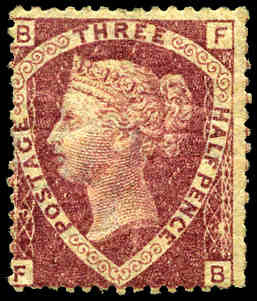 1841 1d Red-Brown Queen Victoria imperf with 3 margins, cancelled with near complete clear No 4 in Maltese Cross postmark. Slightly cut into at top. Corner letters P.C. Sg 8m. Catalogue Value $841.00. 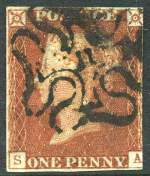 1841 1d Red-Brown Queen Victoria imperf with 3 margins on glued down front, cancelled with complete clear No 9 in Maltese Cross postmark. Slightly cut into at upper right. Corner letters D.K. Sg 8m. Catalogue Value $290.00. 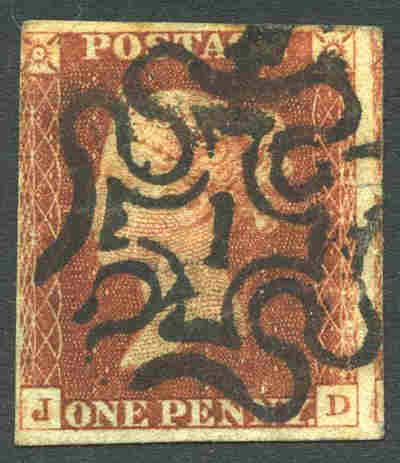 1841 1d Red-Brown Queen Victoria imperf with 3 close margins, cancelled with near complete clear No 11 in Maltese Cross postmark. Slightly cut into at right. Corner letters S.A. Sg 8m. Catalogue Value $525.00. 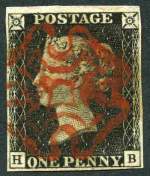 Selection of 10 covers and 8 Entires from 1841 to 1879, mostly franked with 1d Red Queen Victorian issues with a variety of of postal markings, various printings and 2 mourning covers. 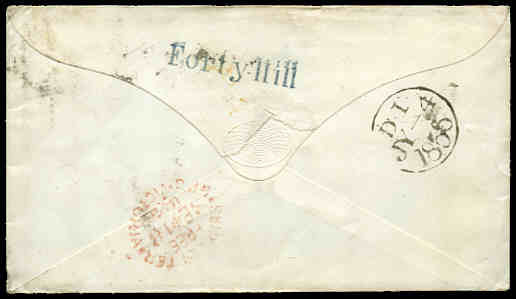 Noted 1841 2d Blue imperf with lines and 3½ margins on cover addressed to Torquay tied by 297 oval numeral cancel with proving Fazeley circular dated double arc postmark and Torquay backstamp and 1841 1d Red imperf on entire addressed to Stockton tied by 133 oval numeral cancel with proving Catterick circular dated double arc postmark and Scorton undated double arc and Stockton backstamps. Interesting lot in generally fine condition. 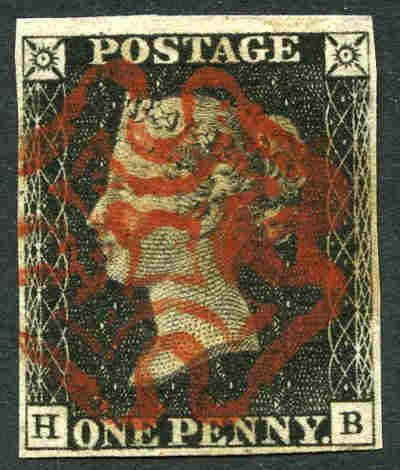 Selection of 15 covers mostly stamped with 1d Red Queen Victoria imperf or perforated issue, one with "E" flaw on "Postage", another stamped with 4d Vermillion Plate 11 with large corner letters and 3 Entires from 1807 to 1875 including interesting range of postmarks, plus 1840 1d Black Mulready envelope unused (faulty) and 8 old receipts. 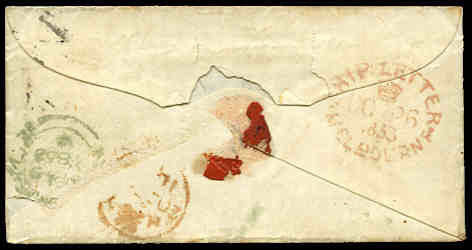 Also Ruhleben WWI internment camp bogus cover franked with set of forged stamps, tied by R.X.D. 15.10.15. 4.15.p.m. postmark. 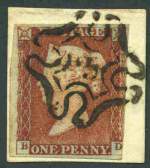 Accumulation of hundreds of used 1d Red Queen Victoria imperf and perforated issues from 1843 to 1867, all on piece or large portion of covers with many multiples and 1841 2d Blue imperf with lines (15). A wide variety of postal markings including Mount Radford Penny Post and Otterton Penny Post unframed Italic Letters, Arwenack St straight line, Braunton, Lamerton, Sherwell and Uffoolm circular undated with double arc, Chillington, Looe and Ottery St Mary circular dated with double arc and many more. Interesting lot for the specialist. 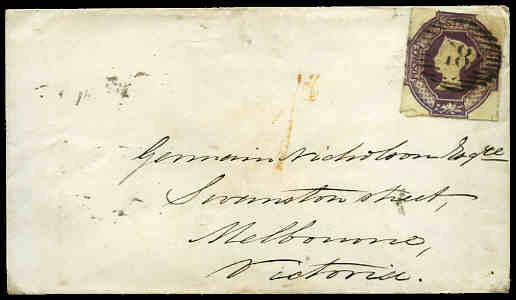 1854 6d Mauve Embossed Queen Victoria cut square with margins just touching in places, fine used on 1856 cover addressed to Melbourne, Victoria, with Blue straight line "Forty Hill" and Red oval Ship Letter, GPO, Victoria backstamps. Sg 58. 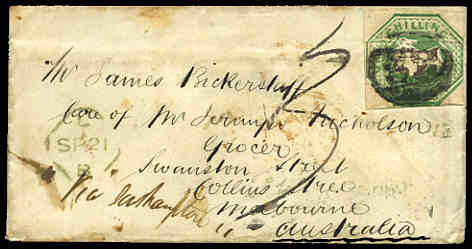 Catalogue Value on cover $2,627.00. 1858 2d Blue Queen Victoria Plate No 12 with thick lines very fine used. Centered to right, otherwise premium quality. Sg 45. Catalogue Value $251.00+. 1870 ½d Rose-Red Queen Victoria Plate No 5 and Plate no 11 MLH. Sg 48. Catalogue Value $368.00. 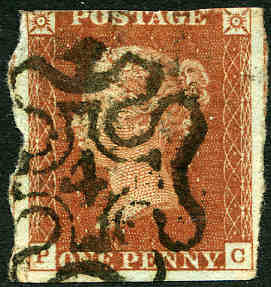 1870 1½d Lake-Red Plate No 3 Queen Victoria MVLH with faint horizontal crease. Sg 52. Catalogue Value $787.00. 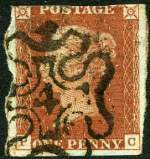 Accumulation of hundreds of used Queen Victorian issues including 1840 1d Black imperf, 1841 2d Blue imperf with lines (15), numerous 1d Reds with a wide variety of Plate No's and postmarks, modest range of later issues, plus small selection of KEVII. 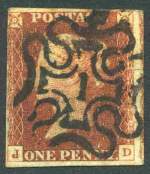 Noted 1841 1d Red-Brown imperfs cancelled with No 2, 6 (3), 7 (2), 8 (4) and 9 in Maltese Cross postmarks. Usual varied condition. Very high catalogue value. 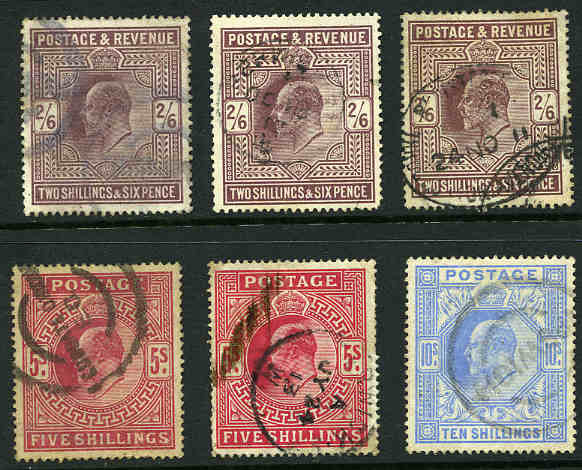 1902-13 Selection of KEVII High Values comprising 2/6 (4), 5/- (4) and 10/- (2) including various printings and shades. Sg 260, 263 (2), 265, 316, 217 (2), 318 (2) and 319. Typical commercially used copies with some minor faults. Catalogue Value $4,835.00. 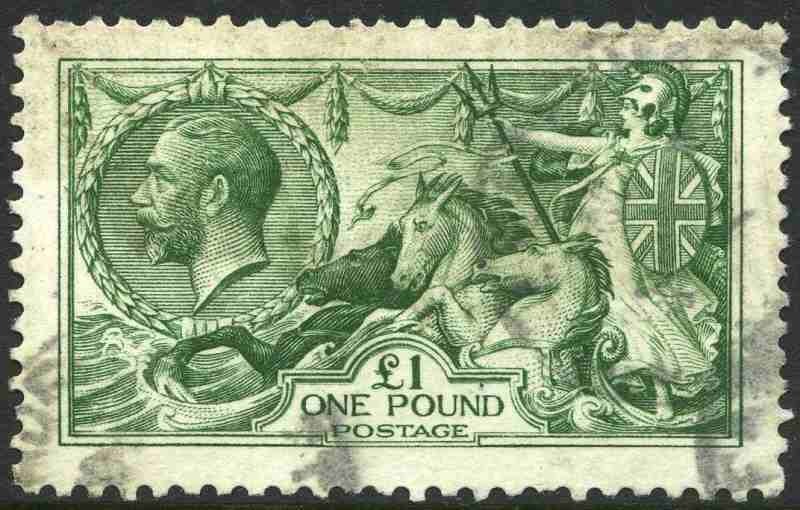 1913 £1 Green Seahorse fine used and well centered with a few shortish perfs at base. Sg 403. Catalogue Value $2,630.00. 1934 10/- Indigo Waterlow Print Seahorse very fine used with original gum. Bent top right corner perf hardly detracts, otherwise premium quality. Sg 452. Catalogue Value $170.00+. 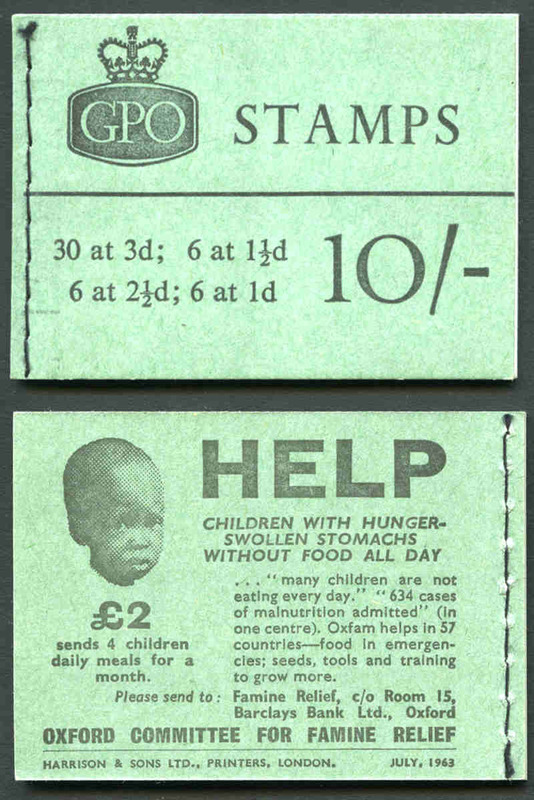 1936 3/- KEVIII booklet MUH. Edition No 322. Sg BC3. Catalogue Value $230.00. 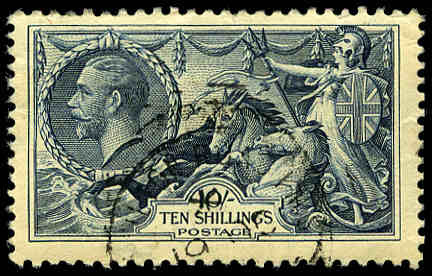 1937-47 ½d, 1d, 1½d, 2d and 2½d KGVI Dark Colours with both Sideways and Inverted Watermarks. 1½d Inverted Wmk has light gum tone. Sg 462-466a and Wi. Catalogue Value $692.00. 1939-48 KGVI High Value Definitive set MUH and well centered. 2/6 values with faint toning and 10/- Ultramarine MLH. Sg 476-478b. Collection of good to fine used KGVI and QEII stamps from 1937 1½d Coronation to 1980 Railway strip of 5 including handy items and numerous sets in loose leaf album. 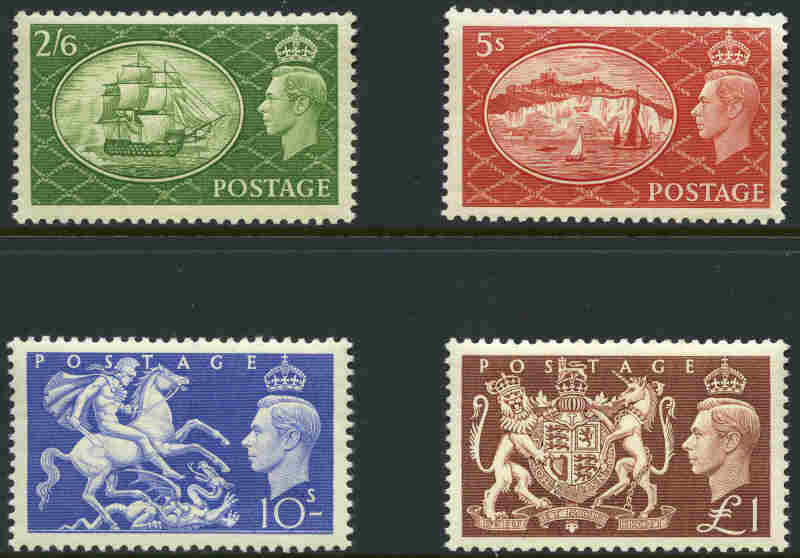 Noted 1939-48 High Value KGVI set, 1948 Royal Wedding set, 1951 Festival set, 1955-58 Waterlow and De La Rue print Castles sets and 1959 1½d Green and 2½d Carmine-Red Graphite-lined Multiple Crown Wmk Wildings with inverted watermark. Odd minor fault, but generally fine condition. 1951 Festivals set MUH and well centered. Sg 509-512. 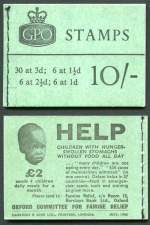 1955 2/6 Wilding (Post Early), 1956 2/6 Wilding, 1965 3/- Wilding with phosphor bands and 1956 5/- Wilding booklets MUH. Sg F25, F45, M73p and H20. Retail $305.00. 1959 3/- Wilding booklet with graphite lines MUH. Sg M13g. Retail $410.00. 1959 5/- Wilding booklet with graphite lines MUH. Sg H39g. Retail $235.00. 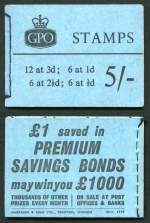 Accumulation of 167 2/- Wilding, 10p and 50p booklets from 1961 to 1978 MUH comprising Sg N3 (3), N21 (9), N24 (6), N25 (3), NR1 (1), NR2 (22), NX1 (8), N29p (10), NP28 (5), NP 30 (2), NP32 (2), NP34 (12), NP37 (1), NP38 (1), NP39 (6), NP40 (1), NP41 (1), NP42 (1), DN47 (10), DN48 (10), DN49 (15), DN50 (10), FA1 (3), FA2 (3), FA3 (1), FA4 (3), FA5 (2), FA11 (11), FB2b (1), FB3a (1), FB3b (1), FB6a (1) and FB6b (1). Retail $610.00. 1963 10/- Wilding booklet MUH. Sg X6. Retail $285.00. Selection of 129 mostly illustrated booklets from 1955 to 1995 including some duplicates and range of Guernsey, Isle of Man and Jersey issues. Catalogue Value £658.00. ($1,380.00). Accumulation of hundreds of Decimal Machin Head issues MUH from 1971 to 2000 including regional issues, phosphor and gum variations and small range of Pre-Decimal issues in Lighthouse stockbook. 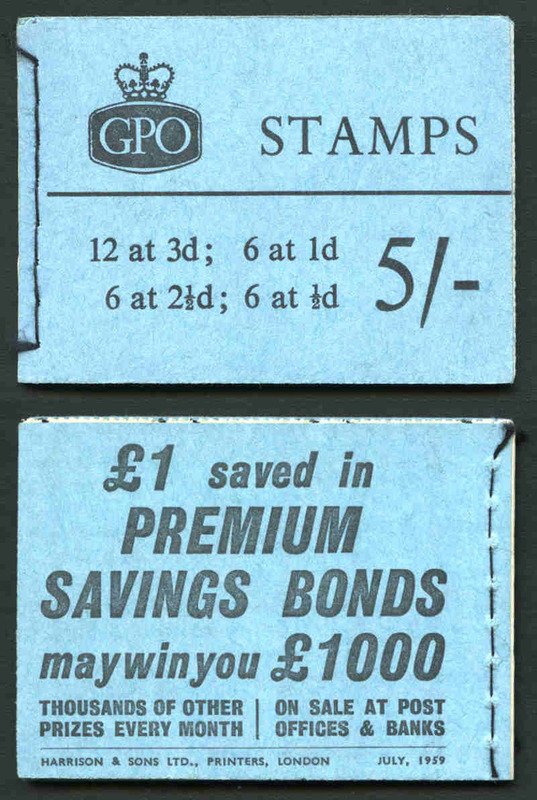 Noted 1972 Wedgewood booklet pane containing ½d side band at left with full perforations and 1977-87 £1 (4), £1.33 (5), £1.41 (5), £1.50 (5), £1.60 (5), £2 (3) and £5 (3) High Value Machin Head issues. Numerous duplicates. 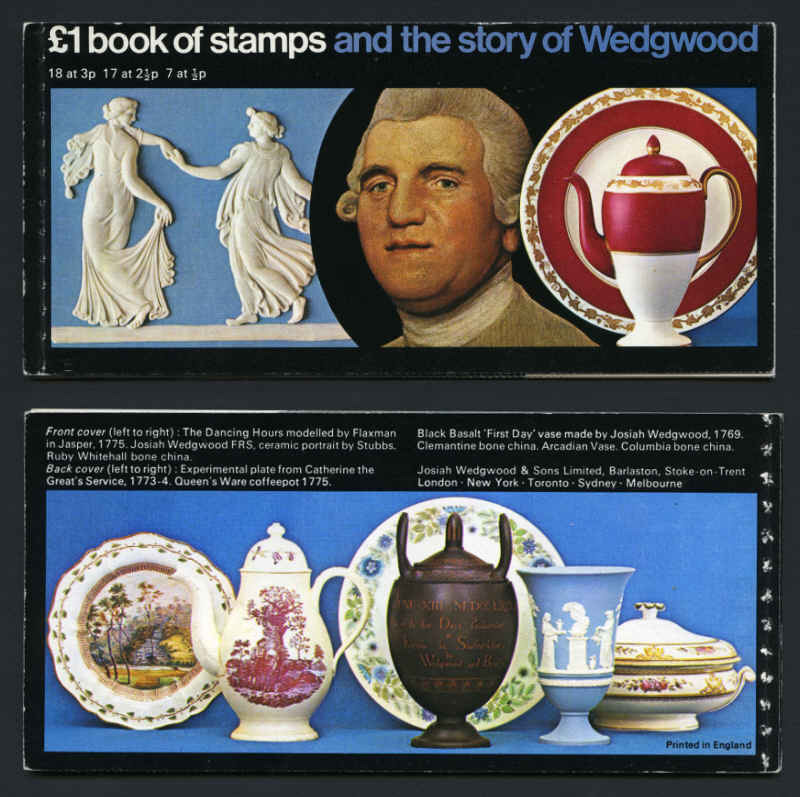 1972 £1 Wedgewood booklet containing scarce ½p Blue Machin Head with 1 side band MUH. SG DX1. Catalogue Value $182.00. Collection of presentation packs from 1977 to 1990 including odd duplicate. Face Value $193.00. Collection of 117 illustrated booklets from 1977 to 1987 including few duplicates. Face Value $253.00. Catalogue Value $1,318.00. Complete set of Collector Year packs from 1980 to 1987. Face Value £60.48. ($127.00). Collection of 127 different Presentation Packs from 1981 to 1998 including some highly catalogued high value Definitive issues. Face Value £207.00 ($434.00). 1980 Wedgewood, 1982 Stanley Gibbons, 1983 Royal Mint, 1984 Christian Heritage, 1985 The Times, 1989 The Scots Connection, 1990 London Life, 1991 Alias Agatha Christie (2), 1992 Cymru-Wales, 1992 Tolkien, 1993 Beatrix Potter, 1994 Northern Ireland, 1995 National Trust and 1996 European Football Championships sponsored booklets. Retail $302.00. Face Value £78.00 ($164.00). 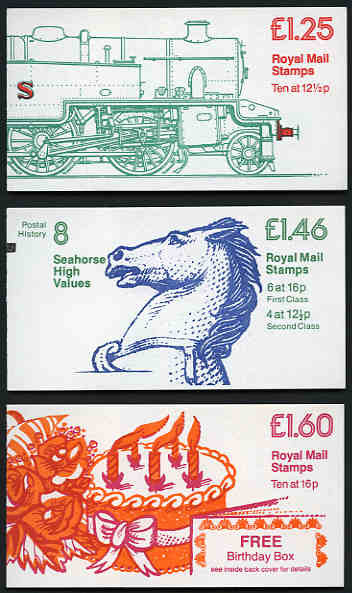 1983 £1.25 LMS Class 4P Passenger Tank Engine Railway booklet with corrected rate, 1983 £1.46 Seahorse High Values Postal History booklet with corrected rate and 1983 £1.60 "Birthday Box" booklet with rates altered and "February 1983" imprint date MUH. SG FK6Aa, FO1Aa and FS1Aa. Retail $303.00. Complete set of Post Office Year Albums from 1985 to 1991. Face Value $140.00. Complete set of Post Office Year Albums from 1986 to 1997. Face Value $284.00. Also Falkland Islands 1983 Year of Liberation collection of 31 stamps and 1 miniature sheet MUH in special album. 1989 Greetings (5), 1990 Smiles (9), 1991 Good Luck (7), 1991 Pillar Box (7), 1992 Memories (7), 1993 Rupert Bear (3), 1994 Rupert Bear, 1995 Clown (3), 1996 More Love (2) and 1997 Flowers (3) Greetings booklets MUH. Sg FY1 and KX1-KX9. Retail £447.25. ($940.00). Selection of MUH commemorative stamps from 1994 to 1998 including 1994, 1995, 1996 and 1997 Greetings booklet panes. Odd duplicate. Face Value $102.00. Accumulation of 300 used higher value commemoratives from 1995 to 2005 comprising 60p to 68p values. Mainly good to fine used with heavy duplication. Odd fault. Catalogue Value $1,300.00+. Accumulation of many hundreds of used QEII period higher value commemoratives to £1.12 and definitives to £10 in small box. Mainly good to fine used with considerable duplication and some faults. Collection of hundreds of MUH stamps from 1936 to 1988 including numerous sets and some duplication in 2 loose leaf albums. Odd early issue MLH. Face Value of Decimal issues £203.00 ($426.00). Collection of MUH Decimal commemorative issues from 1980 to 1999 including many sets and several Greeting stamp booklets and panes. Odd duplicate. Face Value $183.00. Collection of mostly fine used stamps from 1840 1d Black Queen Victoria imperf to 1978 Energy Resources set in 2 Lighthouse stockbooks. 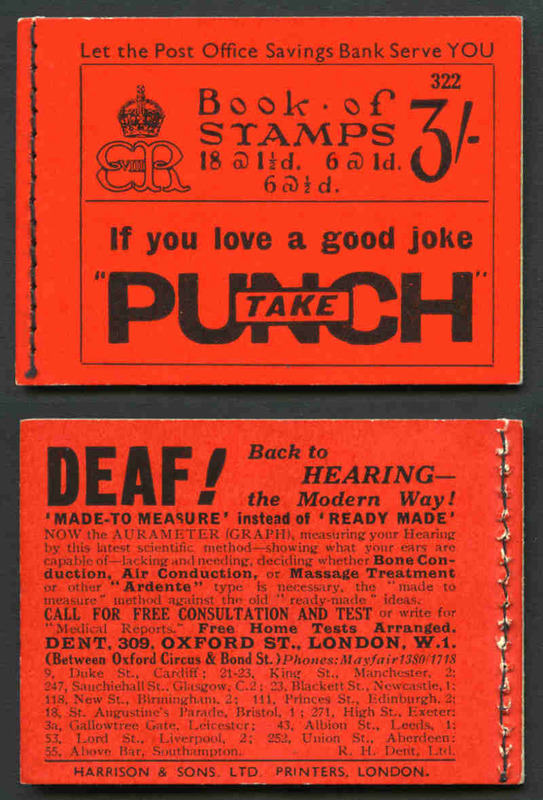 Includes handy range of early issues and largely complete from 1934-36 KGV Definitive set onwards including all Phosphor sets. Odd minor fault. Very high catalogue value. Collection of presentation packs from 1979 to 1990. Face Value £75.15. ($162.00). 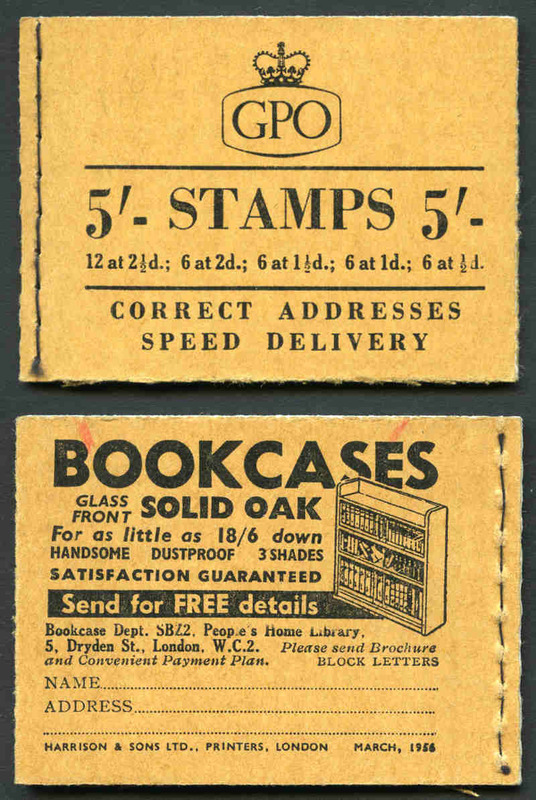 Selection of 444 mint and MUH stamps from a range of periods including range of booklet panes in small stockbook. Some duplication. Collection of MUH and MLH stamps from 1935 Silver Jubilee set to 1996 Christmas set on Stanley Gibbons album pages. Face Value of Decimal issues £251.00 ($527.00). Accumulation of MUH Decimal commemorative issues from 1971 to 2007 including numerous sets. Face Value £437.00. ($918.00). Collection of mint and used stamps from 1937 Silver Jubilee set to 1991 Christmas set on Safe album pages in 2 binders and loose leaf album. All mint Decimal issues from 1979 onwards are MUH. 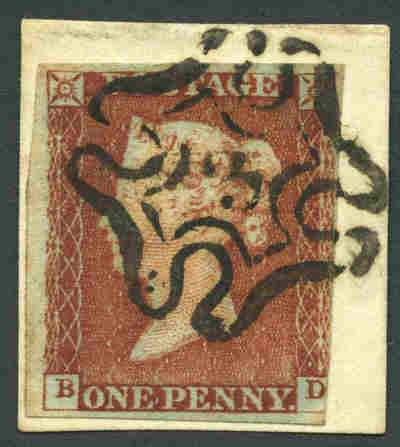 Face value of mint Decimal issues £136.00 ($285.00). 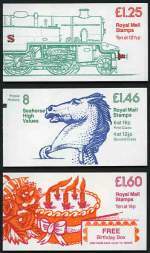 Collection of MUH Decimal commemorative issues from 1977 to 2006 including numerous sets. Face Value £394.00. ($827.00). 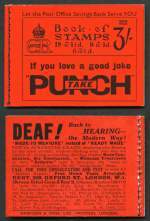 Selection of 35 mint and used Pre-Decimal Postage Due issues including handy items. Catalogue Value $597.00. 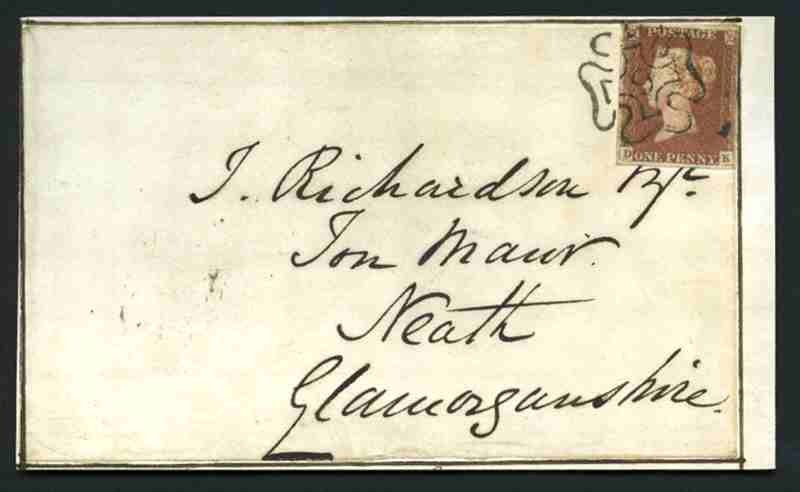 1847 1/- Green Die 1 Embossed Queen Victoria cut square with 3 margins, slightly cut into at base, good used on 1853 cover addressed to Melbourne, Victoria, with Red oval Ship Letter, Melbourne and other backstamps. Sg 54. Catalogue Value on cover $2,100.00. Collection of hundreds of mint and used stamps from 1854 to 1989 including numerous sets and Regional issues in 9 loose leaf albums. Majority of Decimal issues MUH with a face value of £160.85. ($335.00). 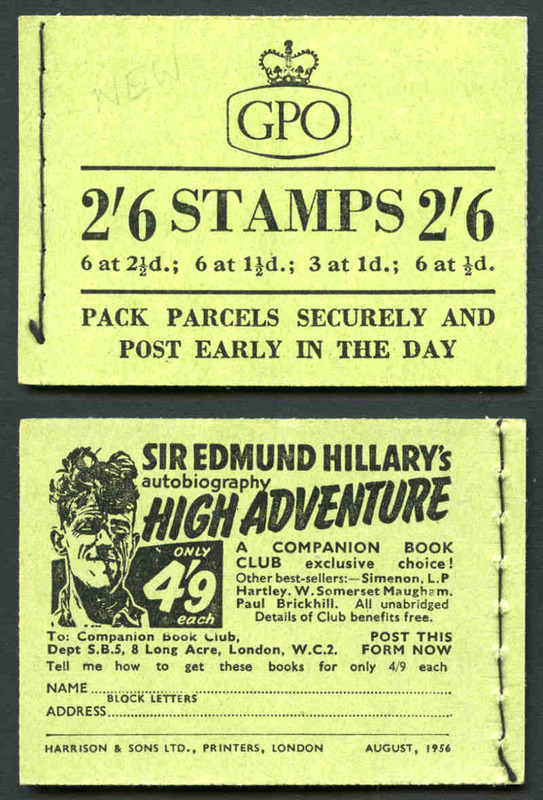 Also 1965 Churchill collection of 193 mainly mint stamps including largely complete Omnibus set in loose leaf album. 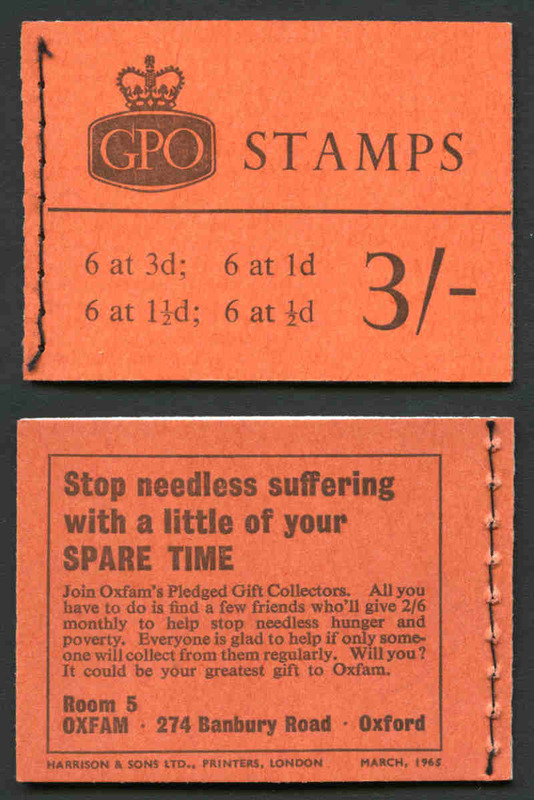 Accumulation of thousands of used stamps from a range of periods off paper in shoebox with some higher value content. Collection of 550 MUH and VFU stamps from 1952 to 2004 including a good range of Wildings issues with sideways and inverted watermarks, a handy selection of scarcer Phosphor issues and a good range of other issues with some modest duplication on Hagner sheets. Catalogue Value $1,575.00. 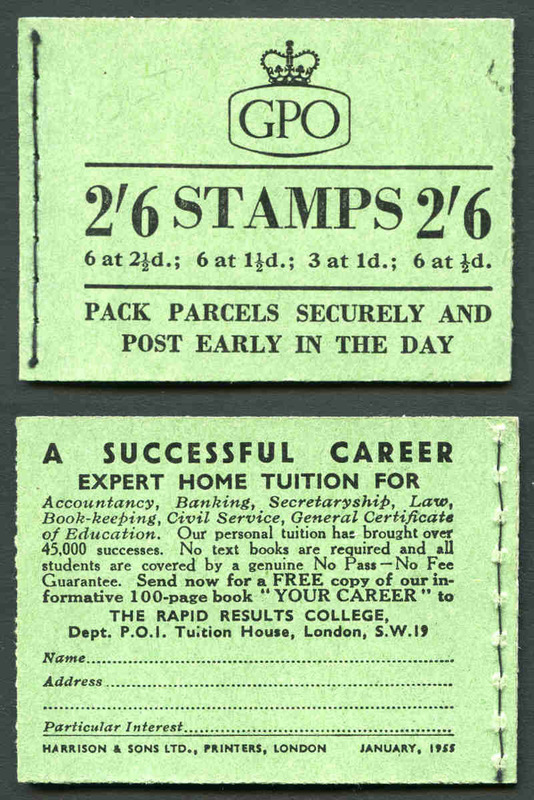 Accumulation of many thousands of used, mainly QEII period stamps from early to modern off paper in large shoebox. Mostly Definitive issues, but includes a proportion of Commemoratives. Collection of many hundreds of mint stamps from 1911 to 1992 including largely complete MUH Decimal commemorative issues, plus small range of covers. Some duplication. 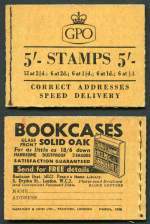 Collection of 282 mostly used stamps from 1840 to 1951 including highly catalogued issues. Varying condition. 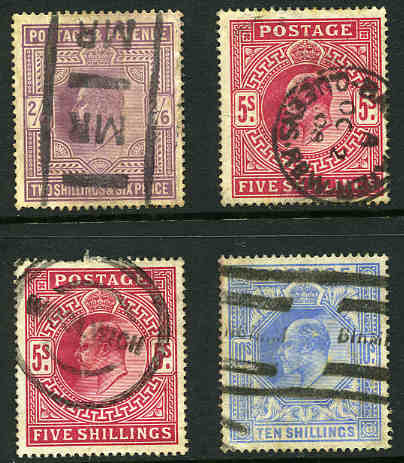 Selection of 389 mostly used stamps from Queen Victorian issues to KGVI including some useful watermark variations and Postage Dues on Hagner sheets. 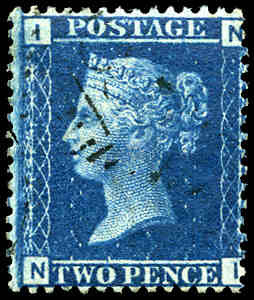 Catalogue Value $5,250.00, but this does not include a 1902 £1 Green KEVII Definitive spacefiller with prominent surface thin. Odd fault. 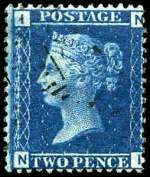 The Postage Stamps of Great Britain 1840-1853 by J.B. Seymour, Part One, Second edition published in 1950 by The Royal Philatelic Society, The Postage Stamps of Great Britain Part Two, The Perforated Line-Engraved Issues by W.R.D. Wiggins, published in 1962 and The Postage Stamps of Great Britain, Part Three, by Beaumont and Adams First edition published in 1954. (3 Volumes). Complete MUH collection from 1941-44 Arms of Guernsey set to 1990 Post Office Buildings set including some duplication in Chinese stockbook. Complete MUH collection from 1941-42 Arms of Jersey set to 1990 Parish Churches set in Chinese stockbook. Odd early issue MLH. Collection of MUH Guernsey from 1941-44 Arms set to 1988 Flora set including Alderney, Isle of Man from 1958-68 Wildings set to 1989 Archibald Knox set and Jersey from 1941-43 Arms set to 1989 Vintage Cars set on Stanley Gibbons album pages in 3 binders. Odd Pre-Decimal issue MLH. Face value of Decimal issues $330.00.